This is a slightly modified version of the original two tutorials on organizing roslisp files and basic roslisp usage that has an easier to understand structure for ROS and Lisp beginners and omits some narrow problem-specific details. The following gives a detailed example to follow for Lisp beginners. We include the dependency to std_msgs to be able to access the message types defined in that ROS package. We include roslisp to be able to use the ROS API in our code. Inside the new directory tutorial_ros_package, create a directory named src where the Lisp files will go. The ASDF files should either stay in the root, or be placed in a subfolder called asdf. ASDF is a build system for Lisp files similar to what CMake is to C++. ASDF systems are the equivalent of CMake projects. roslisp allows to reference any ASDF system that is in any ROS package that you can roscd to, given a few conventions are met. In a nutshell, all you need to do is to place your .asd file (or a softlink to it) into the root of the ROS package. We will be using a non-standard package setup in this tutorial, with distinctive names for the ROS package and ASDF system in order to make finding errors easier. Normally, if there is only one system in a particular ROS package the system should be called as the ROS package with underscores replaced by dashes. We will also create a Lisp package, which is the equivalent of namespaces of C++ and Java. Note that one ROS package may contain several ASDF systems, e.g. -main and -test, and that each ASDF system may contain several Lisp packages (namespaces), e.g. -core, -util, -internal. This declares the system components: a subdirectory named src, and within it 3 files, package.lisp, talker.lisp and listener.lisp. The first file will define the Lisp namespace, and the last two files will contain the code for a simple topic publisher and subscriber that will be discussed in the next section. Note: ALWAYS name the .asd file like the system in defsystem. Otherwise ASDF will fail to load it. One thing to notice is the way the messages from the std_msgs package are referenced. This is a concatenation of the ROS package name and "-msg", so to use the messages in the ROS package std_msgs we write :depends-on (std_msgs-msg). For more information on message and service files read here. This defines our main package, a short nickname, and adds common-lisp and roslisp to the namespace of our package to allow using the functions within common-lisp and roslisp without qualifying them (e.g., roslisp:make-msg turns into simply make-msg). First, we will create a talker node publishing regularly on a topic, and a subscriber node listening to the messages and printing them. Here's the code for the talker. It shows how to use topics, and the code follows the examples given in the basic ROS tutorials for Python or c++. The testing process is described in interactive use chapter below. The following examples use the service definitions from the ROS message and service tutorial. We will briefly summarize the above-mentioned next. We also need to update the dependency on the auto-generated Lisp representation of our service type in our ASDF system definition and (optionally) Lisp namespace definition. We will simultaneously also add the new Lisp files for service server and client to our ASDF system definition. We will call the files add-two-ints-server and add-two-ints-client. AddTwoInts is the service type, declared in a .srv file. The callback should be named with that type. "add_two_ints" is the service name the clients will use and that will appear when rosservice list is called. There will be an example in part 2 of this tutorial. Lisp is most fun when used interactively. You have two alternatives here: either use a pre-setup roslisp_repl package (recommended for beginners) or directly use Common Lisp command line. It is recommended to use Emacs with Slime and rosemacs Slime support. Note that if you have rlwrap installed (sudo aptitude install rlwrap), using this primitive shell will be more tolerable, e.g. This will take care of locating the tutorial_ros_package package and all its dependencies as well as loading the corresponding .asd files. Now, before starting the publisher, make sure you have roscore running in some terminal. Note that you can also start the roscore using the functionality of rosemacs: simply press <Ctrl>+x+r+c, where x stands for "execute", r for "ROS" and c for "core". in two separate Lisp REPLs. You will need two terminals or two running roslisp REPL instances (to start a new roslisp REPL press "<Alt>+x slime") to run both the talker and the listener interactively. Make sure you load the ASDF systems and change the Lisp packages in both Lisp shells. To stop a process in a Lisp shell press <Ctrl>+c+c. First we need to start our server. Make sure a roscore is running in a terminal. Calling (start-ros-node) sets up a ROS node in the context, this is good for interactive use, but else (with-ros-node) as used above in the code is more comfortable, as it closes the node when not used anymore. For the examples, we shall use geometry messages. (roslisp:ros-info params "Param foo exists with value ~a"
and execute the same REPL code for checking the param again. You can use <Ctrl>-<Up> to scroll through history. Now we should get a result 42. Now we want to publish and subscribe on a topic of custom-specified type. Using custom topics is very similar to using custom services. More information on creating custom messages can be found here. To briefly summarize, we do the following. "Illustrates array and compound messages, and rosout functions." "Like listener, except illustrates an array message." #'(lambda (x) (ros-info nil "~&Location is ~a and orientation is ~a"
In this part of the tutorial we will set up a roslisp package to control the turtles in the ROS turtlesim. This time we will use the same name for the ROS package, ASDF system and the Lisp package, making sure to stick to the naming conventions. We include the dependency on turtlesim to be able to access the service and message types. Certain commands of turtlesim need a message of type that is specified in geometry_msgs, so we include that package as a dependency as well. Inside the new folder lisp_turtles create a src directory. To demonstrate how to organize files when a ROS package has multiple ASDF systems, we will collect our Lisp files in a subdirectory turtles, which will correspond to one ASDF system. We will put our *.asd files in the src directory and put a symbolic link to them into the root of our package. This declares the system components: a subdirectory turtles and in there 2 files, package.lisp and turtle-core.lisp. Now, we can imagine having a different ASDF system in the same ROS package, say, lisp-turtles-test.asd, which would have its own subdirectory within src, such that the two are nicely separated. This defines our main package, a short nickname, and adds roslisp to the namespace of our package. We defined some functions to manipulate the turtlesim, if you've gone through the first part of this tutorial you should be able to understand the functions by now. In Emacs, we can now load this system using roslisp_repl. In a fresh REPL, press ",", type in ros-load-system, enter, then type lisp_turtles for the ROS package, then lisp-turtles for the ASDF system. If roslisp_repl does not find those, check that the package can be found by ROS (roscd into it from a terminal), that the link to the .asd file is not broken, and that the name of the .asd file and the name of the ASDF system within are exactly the same. You might need to restart your REPL or manually reinitialize the source registry of ASDF if you started the REPL before creating the ROS package. First, we switch into the LTURTLE package in which our functions are defined. Then we start a node in roslisp which will serve for all the following calls to topics and services. 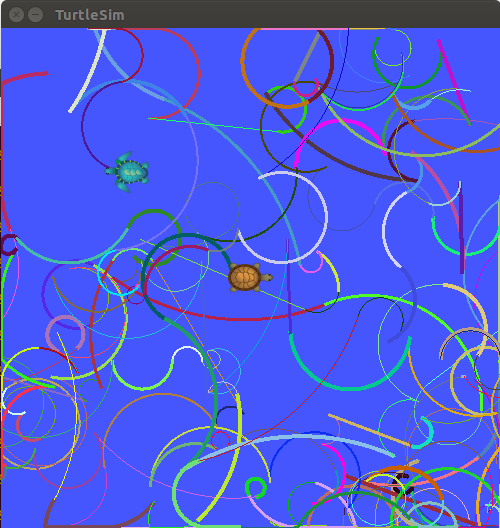 Finally, we spawn a second turtle at (1, 1) using the corresponding turtlesim service. Now you should see a second turtle in the turtlesim window.